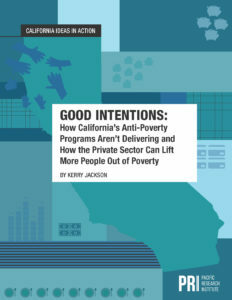 California policymakers should reform government anti-poverty programs to remove incentives against work while expanding job opportunities in the state’s poorest communities, according to a new issue brief released today by the non-partisan California-based think tank, the Pacific Research Institute. Click here to listen to this week’s episode of PRI’s podcast, featuring an interview on California’s poverty crisis with Michele Steeb, CEO of St. John’s Program for Real Change in Sacramento. Causes of California’s unacceptably-high poverty rate include the perverse incentives of government anti-poverty programs that dis-incentivize work, the state’s ongoing housing crisis, and anti-business climate. Lawmakers should look to examples of successful reforms in Wisconsin, Virginia, Michigan, and other states as they evaluate and consider much-needed reforms to California’s current government programs to improve effectiveness and reduce taxpayer costs. Programs like St. John’s Program for Real Change in Sacramento, Solutions for Change in Vista, Working Wardrobes in Orange County, and Father Joe’s Villages in San Diego are examples of real-life private charities that policymakers should consider replicating across the state. One of the most critical things lawmakers can do to reduce poverty is encourage more job opportunities and economic growth statewide, especially in poor communities. Kerry Jackson is an independent journalist and opinion writer with extensive experience covering politics and public policy. As a fellow with PRI’s Center for California Reform, he writes weekly op-eds and blog posts on statewide issues and occasional policy papers for PRI. In 2017, he wrote Unaffordable, an issue brief exploring California’s housing crisis which won bipartisan praise.